These images were taken in vastly different worlds. 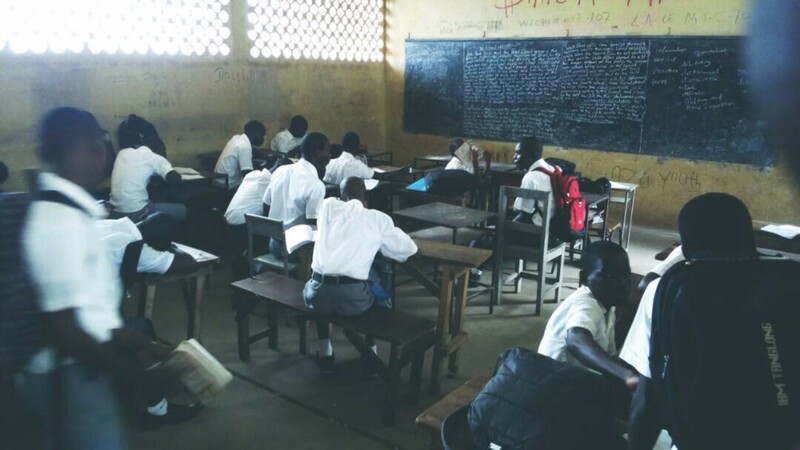 The first photo was taken by a friend who attends a private high school in Freetown, Sierra Leone, West Africa (my apologies for the quality of the image). The other was taken at a public high school in the United States. Sierra Leone is one of the poorest countries in the world. Recently ravaged by civil war, a devastating Ebola outbreak and just a couple of months ago, flooding and a landslide killed nearly 600 not far from where this photo was taken. Illiteracy, teen pregnancy, crime and unemployment rates are staggeringly high. Virtually all of the statistics that can be measured fall into similar extremes. So one would expect the obvious contrast between these two images. On closer inspection, however, it is impossible to ignore that these classrooms are far more similar than they really should be. Look beyond the shiny chrome plating, digital projector, flourscent lighting and the gleaming tile and plastic. Ignore the shadows, poor lighting, dingy chalkboard, mismatched desks and benches and in both classrooms you’ll see the same sharp angles, hard edges and corners. Rigid lines with rows of desks facing front in and an obvious authoritative tone which defies both individuality and collaboration. Neither one looks like a place any child would want to spend much time. No child would describe these rooms as comfortable. 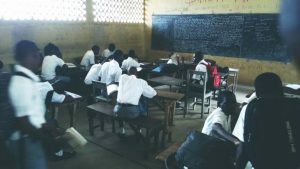 Yet, both of these classrooms would be considered above the average standards of their respective country’s educational environments. Much has been said lately about the failures of American education. Unfortunately, for most of those failings, there is no simple solution. So forget that my 7th grade son has to rush through his lunch and finish in 20 minutes so he can get 10 minutes of fresh air before his next class. He sits at a table closest to the door so he can savour every second of recess. Forget that my 10th grade son carries a 35 pound backpack with him because he cannot make it to his locker and back in the 4 minutes between classes. Forget homework, standardized testing, disappearing art and music classes, sub-standard lunches, rampant overuse of cell phones and a lack of individualized learning. I’m not talking about changing the curriculum or even asking for more time that already doesn’t exist. I just want to make the space where our children spend most of their waking hours more liveable. Disappointingly, the adult work experience is light years ahead of the child’s. While children fidget in plastic and metal chairs as the sounds of the class echo jarringly off the tile floors and cement walls, offices are well into a renaissance. Once dark cramped rooms with flickering, florescent lights and bare, gray cubicles and smoking lounges have given way to collaborative, beautiful workspaces with ample natural light, comfortable nooks with couches and pillows, open meeting spaces, outdoor meditation areas, free snack bars, exercise rooms, flexible schedules and a host of other amenities that improve daily life -because comfortable workers are better workers. It seems to me that the children deserve these things before the adults get them. Apparently, I’m in the minority on that, because while most of the offices I’ve visited seem to be evolving, classrooms haven’t changed at all. I was initially excited to find this article published September 2016 in the Atlantic, “Reimagining the modern classroom” where “Prominent voices in education” share their thoughts on redesigning classroom space. Unfortunately, the title is misleading, because the ideas shared are far from imaginative. In fact, the word “desk” appears 15 times while the word “comfort” (in any form) appears only four times. Most of the teachers, principals and administrators interviewed don’t go much farther than suggesting that furniture should be movable. 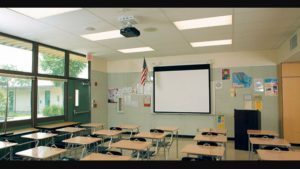 One response proudly adds “My experience as a high-school principal taught me to never spend too much time worrying about the “small stuff.” I put the arrangement of desks in that category.” Another teacher mentions heating and air conditioning. Nobody is thinking outside the cold cinder-block box. That has to change. It has been this way as long as we have had school. In fact, you don’t need to travel to a developing country to see the comparison. 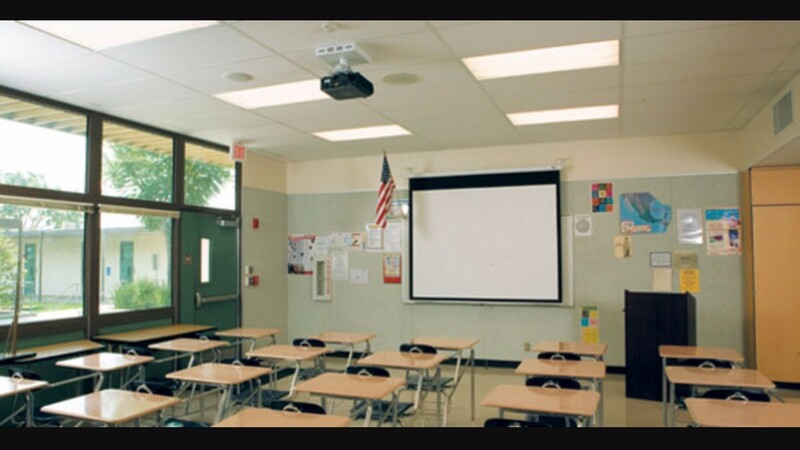 Go back and look at the oldest picture of an American classroom that you can find and tell me how different it is from the ones above. Minus a sprinkling of technology and plastic, classrooms looked just like they do today. Year after year, we accept this life on behalf of our children, who have never had a voice in their own education. More accurately, we don’t really speak for our children at all. Cold, hard and uncomfortable is the way school must be. Our silence is our agreement. Honestly, can you think of anywhere else you would willingly leave your child that is as uncomfortable as his public school? What about your own standards? Ask yourself how long you would last if this was your office? How would sitting hour after hour trying to pay attention and do what you’re told in that room impact your work habits? Your creativity? Your mood? Your social skills? Your enthusiasm for the assignments? Your attention? Your love of learning? Perhaps you’re thinking that you had the same conditions in school and you came out just fine. That is not entirely accurate, because while you may be doing great now, you did not succeed because of the physical environment. You did so in spite of it. You, like every other child, were resiliant. You were accustomed to complying with authority. It never occured to you that things could be different. So you accepted it and found a way through. If you still love learning, thank the teachers who saved your educational experience for you, because it surely wasn’t the classroom. I’m nobody’s Martha Stewart, a small area rug, couch, love seat, a few throw pillows, coffee table, a lamp or two, soft music, electric tea kettle, a few plants and some curtains could go a long way, here. But in public schools all over the country there are teachers out there who have spent money from their own pockets to make their classrooms more comfortable for children. There are principals and administrators who back these teachers in spite of the challenges they face. Every singe one of them shares the same results. More engaged students, better work product, better grades, higher learning, even joy! The problem is that when we put classroom comfort along side science, technology, engineering and math it seems trivial. However not only is a child’s comfort important, it is also less expensive and easier to implement than most classroom lessons. We spend all this time developing STEM lessons at considerable material, training and implementation costs in an effort to save American education. These lessons would carry so much more value if the children learning them actually wanted to be there in the first place. Why not start with the simple fixes first?